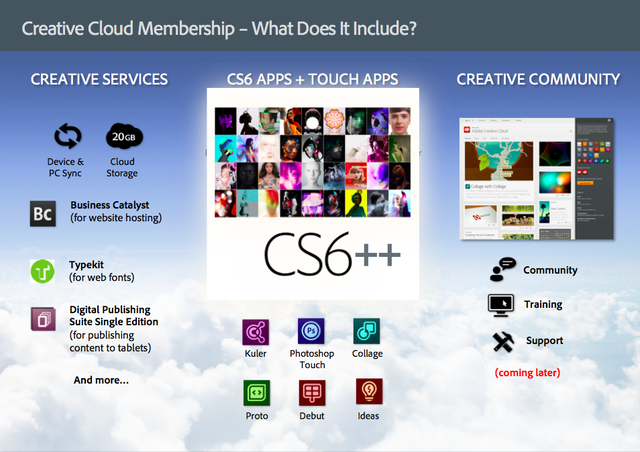 Creative Cloud is Adobe's way of bringing their software to the cloud. For a monthly fee, you get access to all of Adobe's products, get the most updated versions, and can access them from home or work. Your files are also available through the cloud. The subscription fee for this service is cheaper than purchasing licenses for every computer and it will make updates easier on your IT department. The products have been updated with great new features and run faster, you can work on your files in a web browser, and you can work from any device, including an iPad. The Student and Teacher Edition of Adobe Creative Cloud is available for US$29.99/month. Volume licensing for Creative Cloud “team-ready” is available via the Adobe Transactional Licensing Program. More information on Adobe licensing can be found at: http://www.adobe.com/aboutadobe/volumelicensing/education/. One of the nice things with this is that districts will always be able to have the most up to date product, and teachers will be able to access the Creative Cloud from home and school. For more detailed informationabout educational upgrade policies and pricing, as well as the full portfolio of suites, please visit http://www.adobe.com/education.edu.html. Adobe Education Exchange - tips, training, help, resources, lesson ideas, community forum and more for using Adobe products in education.